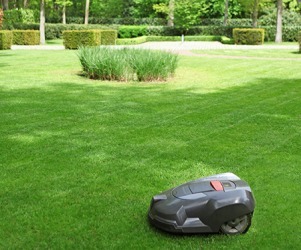 A robot lawn mower might be a good investment for people who dislike yard work. The definition of a robot is a machine that can do specific tasks, and sometimes is given human characteristics, or a person who automatically does work without question or emotion. An example of a robot is the machine that puts bolts on a car door in an assembly line. An example of a robot is the Roomba, a machine that automatically vacuums your house. An example of a robot is a secretary who answers phones in a monotone all day long. "robot." YourDictionary, n.d. Web. 21 April 2019. <https://www.yourdictionary.com/ROBOT>. A mechanical device that sometimes resembles a human and is capable of performing a variety of often complex human tasks on command or by being programmed in advance. A machine or device that operates automatically or by remote control. A person who works mechanically without original thought, especially one who responds automatically to the commands of others. A form of urban dance involving a succession of separate movements executed with precision in imitation of a robot. Czech from robota drudgery ; see orbh- in Indo-European roots. A machine designed to replace human beings in performing a variety of tasks, either on command or by being programmed in advance. A machine built to carry out some complex task or group of tasks, especially one which can be programmed. (chiefly science fiction) An intelligent mechanical being designed to look like a human or other creature, and usually made from metal. (figuratively) A person who does not seem to have any emotions. (South Africa) A traffic light (from earlier robot policeman). (surveying) A theodolite which follows the movements of a prism and can be used by a one-man crew. From Czech robot, from robota (“drudgery, servitude"). Coined in the 1921 science-fiction play R.U.R. (Rossum's Universal Robots) by Karel ÄŒapek after having been suggested to him by his brother Josef , and taken into the English translation without change. A stand-alone hybrid computer system that performs physical and computational activities. Capable of performing many tasks, a robot is a multiple-motion device with one or more arms and joints. Robots can be similar in form to a human, but industrial robots do not resemble people at all. The term is attributed to Czech dramatist Karel Capek in his 1921 play titled "R.U.R. - Rossum's Universal Robots." Capek applied the Czech word "robota," which means "forced labor" or "servitude" to the mechanized people in the skit. Three years later, robots appeared in Fritz Lang's classic silent movie "Metropolis," and they have been with us ever since. A Wide Variety of Applications In manufacturing, robots are used for welding, riveting, scraping and painting. They are also deployed for demolition, fire and bomb fighting, nuclear site inspection, industrial cleaning, laboratory use, medical surgery (see telepresence surgery), agriculture, forestry, office mail delivery as well as many other tasks. Increasingly, more artificial intelligence is being added. For example, some robots can identify objects in a pile, select the objects in the appropriate sequence and assemble them into a unit (see AI). Analog and Digital Robots use analog sensors for recognizing real-world objects and digital computers for direction. Analog to digital converters convert temperature, motion, pressure, sound and images into binary code for the robot's computer, which directs the actions of the arms and joints by pulsing their motors. See AIBO. How Small Can They Get? Million Dollar Man - While not fully a robot, astronaut Steve Austin of the 6 Million Dollar Man TV series became a bionic human with legs, an arm and even one eye replaced by robotic implants that transformed him into a superhuman. Asimov's early robot stories deal, appropriately enough, with the early days of USRobots and the difficulties they encountered both in developing useful robots, and in gaining product acceptance of them once they were available. "Robot" is a term almost one hundred years old, created in fiction before becoming a reality. He needs you to bring him around from robot-mode. But even if I had a robot that knew everything, I couldn't really say, "Tell me every custom they have here" and be fully informed.